Lime scale control in water for domestic, industrial and commercial situations. Cost effective as outlay quickly recouped. First of all, you will not find any photos of scaled up pipes or tanks, or any incredibly high plumbing repair estimates on this website; all we want to do is to show you a solution. Lime scale is problematic in hard water areas and can cause havoc in heating systems, ranging from kettles to boilers. In fact scale or, as it is also known, Calcite will form on any heated surface coming into contact with hard water. We all know the consequences! Expensive replacements of ‘Scaled Up’ appliances and pipe-work. The simple answer is to fit a Scale Invader! An end to encrusted kettles and worse the scale clogged pipe-work in combi-boilers and hot water cylinders. Simple to fit, applicable to domestic as well as industrial applications and with a 10 year guarantee, a very good investment! We are so confident in our product that we offer a no quibble return if not fully satisfied. Scale Invader fitted - no wiring or chemicals and in minutes. 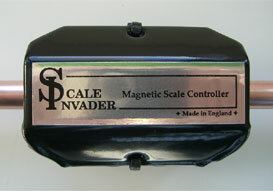 Scale Invader emits high levels of magnetism and should not come into close proximity with computers or other sensitive material, such as mobile phones and credit cards. No responsibility will be accepted if accidental damage occurs due to inappropriate placement or handling.